In my new novel, This Is Me, Debbi, David, I try to walk the line—hopefully with some success—between formulaic writing and being original and honest. Debbi and David are each on a quest. For her, it is a quest to find love and stability (she’s searching in the wrong place). For him, it is a quest to realize a lifelong dream (he has given himself a year to successfully complete his quest or go back to the dull life he left behind, and the clock is ticking). And of course life throws up roadblocks in front of each of them. This Is Me, Debbi, David is a different kind of story for me, and I had a lot of fun writing it. 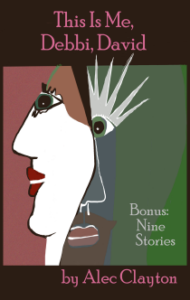 It’s a short novel, and there are bonus stories at the end, nine short stories that in no way relate to the novel. There’s a story about the littlest football player and one about a train trip, a vampire story, one of familial love, and a few that are otherworldly.